When you think of foods that will help you replace red meat in your diet, what comes to your mind? Obviously, not celery. The problem for red meat eaters is that they love the taste of steak, burgers, etc. and they don't want to give it up. Sadly, medical research is finding that excess consumption of red meat is leading to heart disease and cancer. The taste meat eaters like is called "umami", which is the fifth basic taste in additon to sweet, salty, bitter, and sour. I had never heard about "umami" until I started watching "Top Chef". The taste is described as a savory, brothy, rich or meaty taste sensation. And, yes, some of us crave it. Those same people want to live a long time so we need to find other ways to get the flavor without the consequences. Mushrooms are low in calories, fat-free, cholesterol-free and very low in sodium, yet they provide important nutrients, including selenium, potassium, riboflavin, niacin, vitamin D and more. The best part is that you can find PRE-SLICED mushrooms in your produce section right now. They are as easy as meat to cook and while they lack the texture of meat - they have a umami taste that is quite satisfying. Two cups of mushrooms is a whopping 30 calories. Three ounces of cooked red meat (90% lean) is 200 calories. If you can make the shift to mushrooms, you are going to do your waistline a massive favor. In the recipe below, I used a $2 container of sliced mushrooms to make 4 tacos. The calories in this recipe derive principally from the tortilla - and you have to keep your tortilla size and type in mind. I just mixed in some fresh salsa, which I buy in the produce section. These would taste great with extra hot sauce, a little cheese, or anything else you like on your taco. Spray non-stick pan with non-stick spray such as an olive oil mist. Put mushrooms in pan and cook for 10 minutes or until most of the water has been released. Add salsa, heat through, and serve on tortilla. A good way to cook mushrooms is to dry saute them before adding any thing else to a hot pan, they will release there water and turn a deep brown rich flavor. After the water is released,add butter onions ECT to the pan. So easy and sounds delicious! 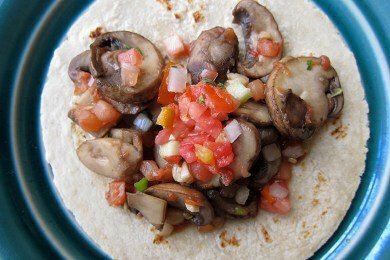 I'm trying to reduce the amount of meat I (and my family) eat and never thought about mushrooms for things like tacos. I may try to slowly substitute, little by little, and see what the rest of the family thinks. They can be iffy on the texture of mushrooms but I think if I mix it in with enough other ingredients, the taste could win them over. Thanks! I adore mushrooms! the white mushrooms sold everywhere is one of my favorites, and i toss it in all the noodle soups i make, probably like you said, because it fulfills that umami-needy part of me. i've always wondered why i'm so suddenly in love with mushrooms (i didn't used to be) but it sort of make sense if it also satisifies the umami taste buds...as when i was younger i ate a lot more meat (mom cooked back then) whereas now that i live alone, i often don't have the time or patience to cook meat (i seem to have issues with cooking meat, it's weird) so either i eat it when i eat out, or just don't eat it at all. result is that i somehow seems to be craving mushrooms more. I have been making this amazing beef & mushroom taco recipe for awhile now & I LOVE it! You are totally right that I could eliminate the meat & just use the mushrooms. had never thought of it! I can promise you the flavor combo in this recipe is sooo good! Ah, the mushroom! One of nature's finest food gifts. A choice delicacy from the earth. Food truly fit for Roman Emperors. Pass the portobellos, please! Mushrooms are awesome! Another, easy thing you can do is substitute them for ground beef in sloppy joes. You just have to cut them up nice and small and then saute them in a bit of olive oil before mixing them with the sauce. Lentils are another option. I wasn't impressed with lentils until I soaked them overnight. I can taste the Umami in sloppy lentils. mushrooms are my absolute favorite veggie! Maybe someone already said this (and I was to hurried to read all the replies), but I bet if you cooked the 'shrooms and then chopped them up, you could achieve a texture similar to ground beef. Great idea for a substitution! Thanks!! I just eat grass fed beef & bison. it's red meat without the baggage. www.http://eatwild.com/healthbenefits.htm It can be cost prohibitive, but if you have a freezer, some of the cost can be mitigated.